Specialty products from Buckeye Lubricants include drawing, stamping, swaging, bending and forming compounds, corrosion inhibitors, cleaners, rolling compounds, bidegradeable sawing fluids, solid tapping compounds and protective hand creams. 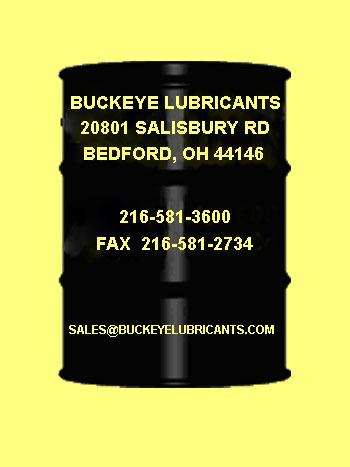 Buckeye Lubricants manufactures a number of specialty products and the more popular ones are detailed below with links to data sheets for each one. Buckeye 212-B-164-80 is an outstanding drawing & staming compound suitable for the most severe operations including deep draws. Buckeye 6213HF is an excellent corrosion inhibitor suitable for applications requiring long term indoor storage. Buckeye 888-61 is a superior cleaner that can be used to clean a machine or system or to clean parts after machining or grinding. Buckeye Titan Lube 1129 is an outstanding metal forming lubricant used on aircraft industry applications for swaging, bending, forming, etc on difficult alloys. Buckeye Vari-Lube #2 is a synthetic lubricant developed to provide excellent performance on sawing and other machining operations and is applied by misting very small amounts onto the blade or tool resulting in minimnal use and carry out. Buckeye Van Roll #4AD was developed to provide superior performance on rolling applications while evaporating almost immediately after production to allow painting or coating operations to proceed without requiring cleaning. Buckeye TAP-STIK is solid subricant that offers excellent performance on tapping and machining operations. Buckeye NAT-CHUR Cream #9 was developed to keep operators' hands protected and moisturized while working in coolants and in other demanding environments. It also offers outstanding protection for leather and similar materials.